Today Keith Jarrett is rather notorious for the stern reprimands of his audience. The reasons are photographing or coughing. His public-bashings have earned him the reputation of a capricious diva, especially after he was expelled from the Umbria festival after a legendary rant in 2007 (the organizer took back the expulsion for the festival in 2013). 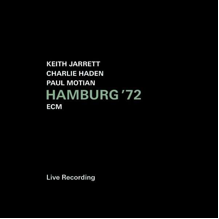 Unfortunately, Jarrett is now in danger of being remembered more for his arrogance than for his art, which is a pity if you listen to recordings like Hamburg ’72, a beautifully recorded live concert by his first trio with Charlie Haden (b) and Paul Motian (dr). And if you listen to Jarrett’s current Standards Trio with Gary Peacock and Jack DeJohnette, which has recorded marvelous albums on the one hand (for example the At the Blue Note box set) but which has also stagnated in high-polish boredom recently on the other hand, or to Jarrett’s rather failed solo performances like Radiance or Rio, this recording makes you feel nostalgic. Haden and Motian are congenial partners for Jarrett, they are far more present than Peacock and DeJohnette, especially Haden’s well-structured, voluminous and earthy playing enabled Jarrett to rock and swing lustily that it is a real joy. The band is moving to and fro between modern jazz, lyrical ballads and free improvisation, since Jarrett is not only on piano on this album but also on flute, percussion, and soprano saxophone. It is a real surprise how excellent Jarrett is on these instruments emulating his great idol Ornette Coleman (one of the compositions is called “Piece for Ornette”), even if it helps that he is augmented by an exuberant Motian and a robust Haden, who prove that they could play very freely as well. “Rainbow”, a composition by Jarrett’s former wife Margot, is a typical Jarrett waltz and gradually shifts to an improvisation alternating majestic and very quiet chords – something he has become famous for with his later albums like The Köln Concert or Bremen/Lausanne. There is an enthusiasm in his playing which is so often missed today. The real highlight of the album is “Take Me Back”, a track based on the chord progressions which have almost become a Jarrett-cliché later on, but which sound so fresh and energetic here that you want to plunge in them forever. You can even hear Jarrett jubilating in the background before the piece flows into “Life, Dance ”, a wonderful three-minute-miniature, in which he varies the theme of the Friedrich Hollaender/Marlene Dietrich classic “Ich bin von Kopf bis Fuß auf Liebe eingestellt”. The album ends with Haden’s “Song for Che” from the legendary Liberation Music Orchestra album with Haden bowing wildly and Jarrett who starts the piece on saxophone and comes back to sparkling piano chords at last. Hamburg ’72 is a lost classic, only the flute part on “Everything That Lives Laments” is a weaker moment, which is just saved by Haden’s powerful expression and Motian’s very subtle, finely engraved and rattling percussion. And itis another treasure raised from the ECM archives. It’s a great opportunity to re-discover Jarrett and this marvelous trio. By the way: There is a lot of coughing in the audience. Enjoyed the review. It's a pity Jarrett has not played with others apart from the Standards Trio for more than twenty years, with the exception of the recordings with Charlie Haden. He's often at his best when stretched a bit, but clearly has no interest in pushing himself in that direction. I've always thought that a quartet with someone like, say, Joe Lovano, would be interesting to hear. Keith Jarrett: The Richard Clayderman for the Bildungsbürgertum; purest kitsch, that's what it always was. I suppose Jarrett played in Miles Davis`Band once, only because Miles wanted kitsch...which is absolutely legitimate; but Jarrett for himself was always unbearable kitsch. I'm a big fan of kitsch lorraine. I am surely no fan of Keith Jarrett's music in general, but I disagree at least partly, Zuckerwurzel. Apart from the fact that Clayderman is a poor musician (which Jarrett definitely is not) Jarrett's music hasn't always been kitschy. I agree that there are incredibly lame albums but as I said in the review there are some marvelous ones as well. Like the ones with Dewey Redman (Survivor's Suite e.g.). As Martin says, theres a tendency to sentimentality in Jarrett's music that sometimes wanders into Kitsch, but I don't hear it in his music with Miles, and I wouldn't describe it as the dominant strain. And is it really fair to judge Jarrett by how others rate his music - Can all the hyperbole really be laid at his door?